I love that the creaminess in this soup does not come from cream! The milk, corn, and cooked potato all make a really creamy, delicious soup. In a large pot, sauté onion in olive oil until golden. Add potatoes and water or stock (if using water, add ½ tsp salt). Bring to a boil, cover, and reduce to simmer. Check after 5-10 minutes and remove from heat when potatoes are tender. Scoop half of the potato-onion mixture into a food processor or blender and puree (or scoop into a bowl and use an immersion blender). Scrape back into pot. Without washing the work bowl, puree 12 oz corn, adding milk to create a smooth mixture. Add corn puree to potato-onion mixture. 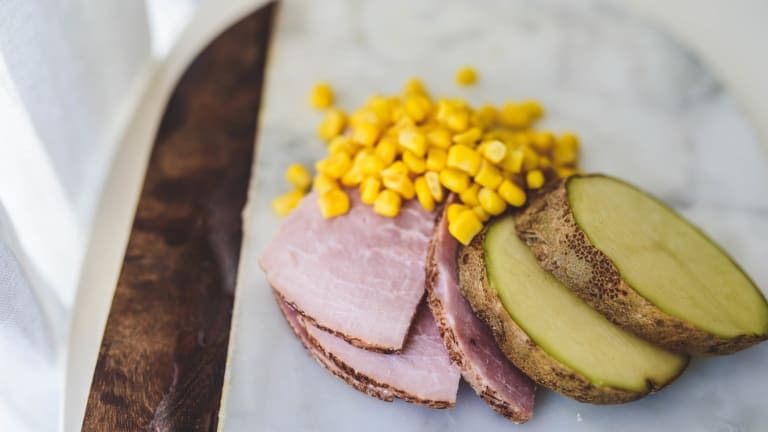 Stir in whole corn, bell pepper, ham, and dill. Heat over medium heat and bring to gentle simmer (don’t boil). Add salt and pepper to taste. Cook gently for 5 minutes then serve.